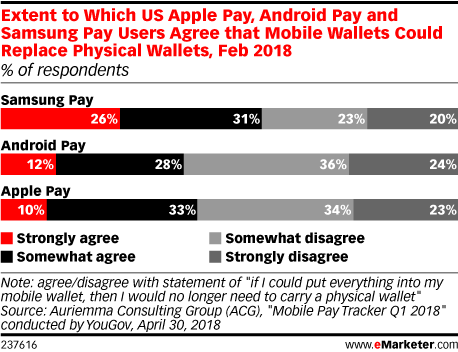 Data is from the April 2018 Auriemma Consulting Group (ACG) report title "Mobile Pay Tracker Q1 2018" conducted by YouGov. 1,527 US smartphone users who are eligible to use Apple Pay (n=525), Android Pay (n=491) or Samsung Pay (n=511) were surveyed during January 25-February 5, 2018. To qualify for the survey, respondents had to own A. an iPhone 6/7/8/X (any model) or Apple Watch (linked to iPhone 5 or newer); B. a Samsung Galaxy S6/S7/S8 (any model), Galaxy Note 5/7/8, Gear S2/S3 (linked to Android/iOS smartphone); or C. any other Android phone with KitKat OS (v4.4) or newer. All respondents also have a general purpose credit card in their name. Auriemma Consulting Group (ACG) is a management firm for the payments and lending industry.